A scene similar to this will play out in Clearwater, Fla., shortly. Nothing says baseball is near quite like shoveling snow steps on the 11th of February. The Phillies equipment truck has arrived in Clearwater, the Phanatic’s hot-dog launcher has been unloaded at Spectrum Field, and spring training is finally ready to begin. The Phillies have not signed Bryce Harper or Manny Machado yet, but they have still provided a dose of excitement before camp opens by adding J.T. Realmuto. The Phillies think he’s the best catcher in baseball, and they are right. Workers on Friday loaded a truck with the Phillies' equipment and personal belongings destined for spring training in Clearwater, Fla. So how much is Bryce Harper or Manny Machado worth? According to Baseball Prospectus, signing one of the two superstars would be enough to project the Phillies as a playoff team. The website released its annual PECOTA projections last week and listed the Phillies as the third-best team in the National League East with an 84-78 record. It was a four-win improvement from last season. Baseball Prospectus expects four NL East teams — the Phillies, Braves, Mets, and Nationals — to finish with at least 85 wins and Washington to win the title. Just one team, the 90-win Braves, finished last season with more than 82 wins. A few hours after the first projections were released, they were already outdated. The Phillies traded for catcher J.T. Realmuto, and their projection improved to 86-76. The Phillies remained in third place, but Realmuto was enough to put them in the hunt for the second wild-card spot. A superstar, Baseball Prospectus projects, would be enough to push the Phillies past Washington’s 89 wins for the division lead and the second-best mark in the National League. Harper, Baseball Prospectus projects, would be worth 4.6 wins. Machado would be worth 3.8. Nick Williams, who Harper would replace in the lineup, and Maikel Franco, who Machado would replace, are both projected to be worth less than one win. The Phillies still expect to enter the season with Machado or Harper, yet nothing seems imminent as spring training nears. But the upgrades are obvious. The Phillies haven’t signed Bryce Harper or Manny Machado, but neither has anyone else. Mike Sielski writes how the Phillies still have time to spend their stupid money. The Phillies believe they are contenders again, and Bob Brookover writes how the team has reached that point without several players they expected would help them get there. “When you’re at the early stages of a rebuild, one of the hardest things is to close your eyes and visualize what the roster is going to look like when you get back to the playoffs,” Matt Klentak said last week. “It’s hard. You don’t know." 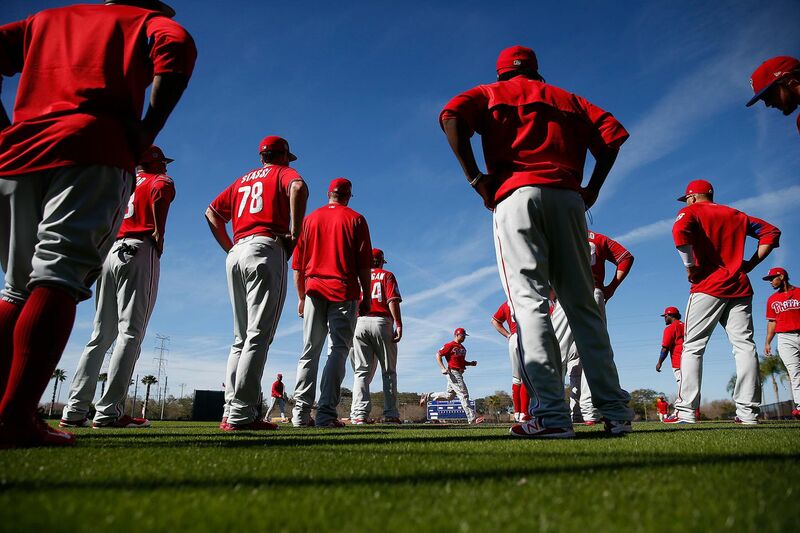 Tomorrow: Phillies pitchers and catchers report for spring training. Wednesday: The pitchers and catchers hold their first workout of spring. Sunday: Position players report to spring training. Feb. 18: The Phillies hold their first full workout. Feb. 22: Grapefruit League opener at Rays, 1:05 p.m.
J.T. Realmuto led major-league catchers in speed last season -- well, maybe not during his home-run trot. J.T. Realmuto led all catchers last season in OPS, but did you know he also was the fastest catcher in baseball according to MLB Statcast’s sprint-speed metric? Don’t expect Realmuto to steal many bases, but it’s a good indication of the type of athlete he’ll be behind the plate. Answer: Thanks, Larry. I would be surprised if the Phillies are unable to extend Realmuto after the 2020 season as long as he continues to produce. The only players they have signed past 2020 are Jean Segura, Andrew McCutchen, Odubel Herrera, and Scott Kingery. Even if Aaron Nola is signed by then to a long-term deal and the Phillies are paying Bryce Harper or Manny Machado, they’ll have plenty of resources left to sign Realmuto. They have tremendous payroll flexibility. I thought the price was steep for Realmuto. The Phillies gave up their best pitching prospect in 15 years. But they did it because they think they have a shot to win now instead of waiting for Sixto Sanchez to develop. There’s something to that. You have to give the Phillies credit for going for it. Now, they just need to sign Harper or Machado to make it really worth it.